The topographic map illustrated in Figure 10l-1 suggests that the Earth's surface has been deformed. This deformation is the result of forces that are strong enough to move ocean sediments to an eleveation many thousands meters above sea level. In previous lectures, we have discovered that this displacement of rock can be caused by tectonic plate movement and subduction, volcanic activity, and intrusive igneous activity. 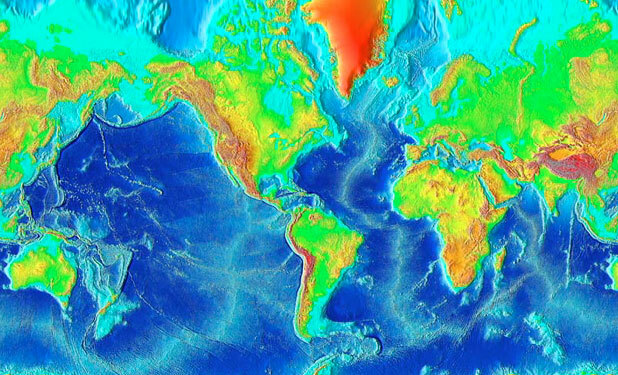 Figure 10l-1: Topographic relief of the Earth's terrestrial surface and ocean basins. Ocean trenches and the ocean floor have the lowest elevations on the image and are colored dark blue. Elevation is indicated by color. The legend below shows the relationship between color and elevation. (Source: National Geophysical Data Center, National Oceanic and Atmospheric Administration). The rock material must have the ability to deform under pressure and heat. The higher the temperature of the rock the more plastic it becomes. Pressure must not exceed the internal strength of the rock. If it does, fracturing occurs. Deformation must be applied slowly. A number of different folds have been recognized and classified by geologists. The simplest type of fold is called a monocline (Figure 10i-2). This fold involves a slight bend in otherwise parallel layers of rock. An anticline is a convex up fold in rock that resembles an arch like structure with the rock beds (or limbs) dipping way from the center of the structure (Figure 10l-3). Figure 10l-3: Anticline fold. Note how the rock layers dip away from the center of the fold are roughly symmetrical. A syncline is a fold where the rock layers are warped downward (Figure 10l-4 and 10l-5). Both anticlines and synclines are the result of compressional stress. Figure 10l-4: Syncline fold. 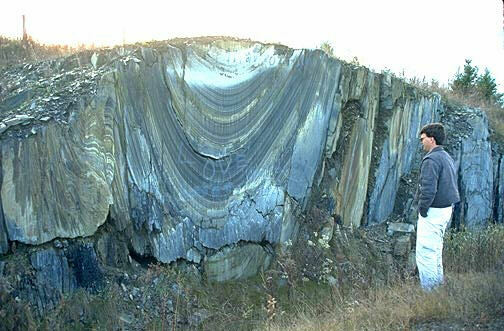 Note how the rock layers dip toward the center of the fold and are roughly symmetrical. Figure 10l-5: Synclinal folds in bedrock, near Saint-Godard-de-Lejeune, Canada. (Source: Natural Resources Canada - Terrain Sciences Division - Canadian Landscapes). More complex fold types can develop in situations where lateral pressures become greater. The greater pressure results in anticlines and synclines that are inclined and asymmetrical (Figure 10l-6). Figure 10l-6: The following illustration shows two anticline folds which are inclined. Also note how the beds on either side of the fold center are asymmetrical. A recumbent fold develops if the center of the fold moves from being once vertical to a horizontal position (Figure 10l-7). Recumbent folds are commonly found in the core of mountain ranges and indicate that compression and/or shear forces were stronger in one direction. Extreme stress and pressure can sometimes cause the rocks to shear along a plane of weakness creating a fault. We call the combination of a fault and a fold in a rock an overthrust fault. Faults form in rocks when the stresses overcome the internal strength of the rock resulting in a fracture. A fault can be defined as the displacement of once connected blocks of rock along a fault plane. This can occur in any direction with the blocks moving away from each other. Faults occur from both tensional and compressional forces. Figure 10l-8 shows the location of some of the major faults located on the Earth. Figure 10l-8: Location of some of the major faults on the Earth. Note that many of these faults are in mountainous regions (see section 10k). There are several different kinds of faults. These faults are named according to the type of stress that acts on the rock and by the nature of the movement of the rock blocks either side of the fault plane. Normal faults occur when tensional forces act in opposite directions and cause one slab of the rock to be displaced up and the other slab down (Figure 10l-9). Figure 10l-9: Animation of a normal fault. Reverse faults develop when compressional forces exist (Figure 10l-10). Compression causes one block to be pushed up and over the other block. Figure 10l-10: Animation of a reverse fault. A graben fault is produced when tensional stresses result in the subsidence of a block of rock. On a large scale these features are known as Rift Valleys (Figure 10l-11). Figure 10l-11: Animation of a graben fault. A horst fault is the development of two reverse faults causing a block of rock to be pushed up (Figure 10l-12). Figure 10l-12: Animation of a horst fault. The final major type of fault is the strike-slip or transform fault. These faults are vertical in nature and are produced where the stresses are exerted parallel to each other (Figure 10l-13). A well-known example of this type of fault is the San Andreas fault in California. Figure 10l-13: Transcurrent fault zones on and off the West coast of North America. (Source: U.S. Geological Survey).